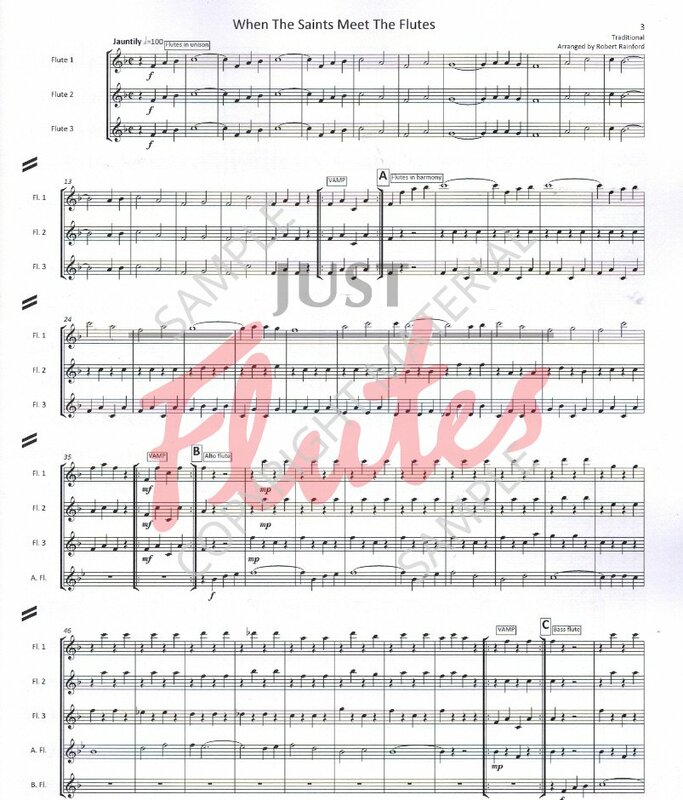 This piece has been created to give the flute choir a chance to introduce the entire flute family to the audience in a lighthearted, fun way using the tune ‘When The Saints Go Marching In’. At each ‘vamp’ section, while the flutes continue to play the ostinato pattern the narrator (this can be the conductor or a dedicated narrator) can talk to the audience about the flute that is about to play the next ‘verse’ of the tune. The style of the narration can be varied depending on the nature of the situation. It may be possible to hold up the various flutes next to each other to give the audience an idea of the comparative sizes of the various instruments. 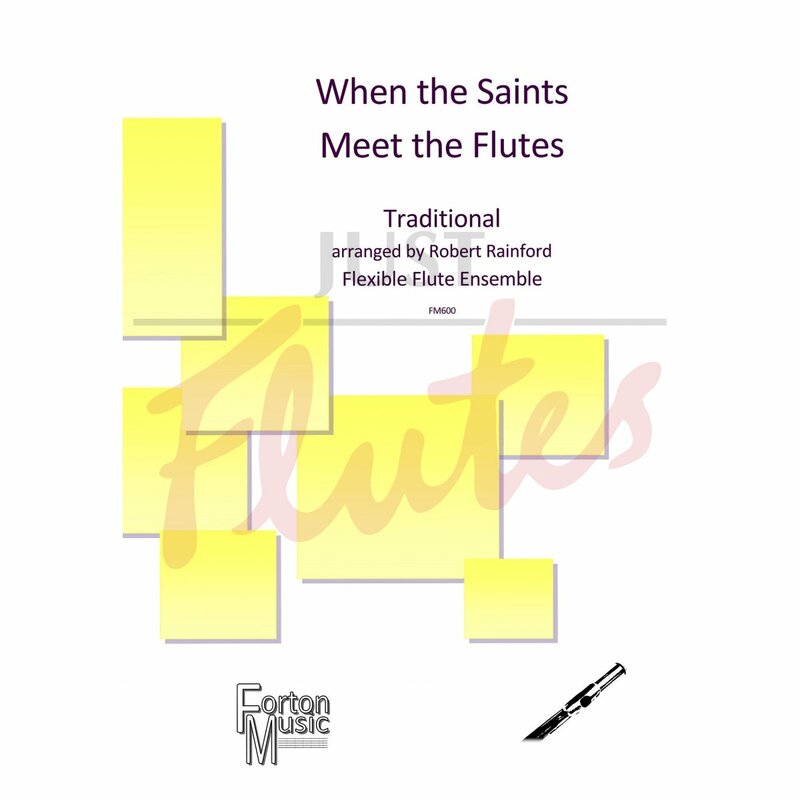 You could also talk about relative pitches of each member of the flute family, their development, some repertoire (both solo and orchestral), and about the development of the flute choir as an ensemble. 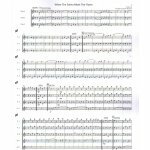 This piece is performable with the minimum forces of piccolo, 3 flutes, alto flute and bass flute. The sections featuring the other, rarer member of the flute family can be omitted by cutting from the end of any vamp bar to the letter where the next available solo instrument takes the tune. Following the entry of the last solo instrument (the piccolo) there are two sections for the full flute choir. One also features some hidden flute ‘lollipops’ that you may or may not want to draw the audiences attention to, and the final section is a jazzy finale with the option of swinging the quavers. Above all, this arrangement was produced to be usable. Please feel free to adapt it in any way you like to help us introduce audiences to the great sound of the flute choir!